Lyrical introduction? Why the hell not! That song is called Glory, featured in Selma. Back after a brief hiatus. In coming back from LA and resuming my life it’s been sorta cray. It’s nice to return to this with open yet life-tired eyes. I haven’t really broached theater topics and race relations like I should on this, so here goes nothin! As an artist who wears many theatrical hats, I’m learning recently that my philosophy when it comes to art-making is that comfort is dangerous and radical is creating a voice for the voiceless. I don’t ever want to make a piece of artwork that is well received because no one left thinking. Don’t thank me for my work. Leave wanting to change something. If you’re mad. Great. If you’re provoked? Even better. Don’t sit in my theater with a big smile on your face and leave feeling like you have nothing to question. I’ve been thinking lately on the effect of clapping in the theater. We as audience members are expected to clap, to have a standing ovation to announce our approval for a job well done. The theater that I want to make rebels against that aesthetic. I want to make theater that is ceremonial and more memorial in nature. “Mmm if you feel it and hollar if you hear it”, snap if you feel something, in more interactive theater, which involves, I think, more room for allowing things and moments to hit and circulate rather than hit, bounce and stay hanging in the space like a noose waiting for a “criminal’s” neck. Yea, I just gave you that visual.I’ll come back to it later. Exactly a year ago, I was directing a piece that I think will always remain with me. It was written by a now friend of mine, produced by friends of mine and acted by people, some of whom became… you guessed it, friends as well. As I’ve been working so closely within theater in the year afterward, I’ve had to question both my role as an artist and as an activist. I believe and I could be wrong that the role of ones’ very body on the stage is active and can quite possibly be a form of activism. This is true for me of directing, playwriting, dramaturgy, etc. Even though it is behind the scenes, it is still an activated position. My choice then as an activated member is to choose to use my powers for good in forward movement or for evil in backward or warped movement. Lets talk a little about the things I’ve learned about the work I want to make from a theatrical perspective. Color-blind casting is when a person is placed in a role, regardless of race, culture, background, etc. Now acting is tricky, because we place ourselves in roles where we have to “be” other people, despite having or not having that characters’ experience in our own lives. This is where things get sticky and racist. White people have been playing roles that should belong to people of color for as long as acting has been around. Countless white men have played Othello, Natalie Wood played a Puerto-Rican Maria in West Side Story, God’s of Egypt entire cast, etc. I could go on for ages. But what about when a person of color is put in a traditionally white role? What are we then saying? How are we asking them to erase themselves instead of using who they are and what they bring to inhance a role? Color blindness is refusing to see the person’s difference and attempting to suppress any mention of it entirely. Color-conscious casting is a lil bit different. Can be just as problematic and racist but it is in fact different. Color-conscious casting is when a person is cast across race for the purpose of creating a radical response. Full acknowledgement of that person’s color is present, therefore they themselves are not erased. It’s thought provoking. I’ve played around with it before, to some extent it was successful in creating conversation. Color-consciousness is accepting and in fact lifting the dialogue of this brown body in this white space and visa versa. I recently finished a play called Rachel, written by Angelina Weld Grimke and was one of the first anti-lynching texts. It was written in 1916. As the dramaturg, part of my responsibility was to find and collect the names of those who had been lynched in this country between the 1800s – present day. I had to while in this process, grapple with the unknown. Even as an Africana major, I didn’t know so many of these names, these men, women and children, my ancestors who had been brutally raped and murdered. I once heard that the best way to silence a voice is to make it believe that none came before. Theater reflects real life, our struggles, our strengths, our humanness. 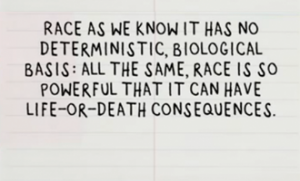 If that is true, then it also reflects our racial systems of oppression. How often to we create work that is for the “oppressed” populations of this world? How do we honor those? How do we gain information? As an artist, who do I want to make work for? How do I uncover that? Is it forward movement for me as a black queer woman to play with color-conscious casting? How do I continue with my art, when scared of being the biggest hypocrite of 2016? Thanks for the lyric Kendrick. What Scares You the Most? Do That.